Of course, I jazzed it up a bit and made it much tastier but still. I had to be honest here. I am in love with it you guys. I feel so bad for all the veggie spring rolls I ate previous to making this delicious dip for them to swim in before going into my mouth. RIP tasteless spring rolls. 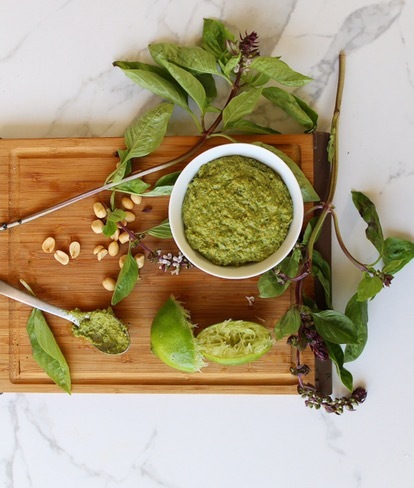 J/K my peanut sauce is the bomb too but this THAI BASIL PEANUT PESTO is everythingggg and more!!! Also, it’s official. I am a farmers market junkie and really cant imagine spending my weekends any other way. Yes, I paid $5 for a giant avocado and I liked it!! I also grabbed this giant bouquet of Thai Basil for only $1 so I’m pretty sure its 1 to 1 on the Paris vs. Market battle. This recipe is so bright and tasty, you’ll want to add it to everything. Plus it comes together in a matter of a few minutes so really a win win win! It’s herby, nutty, sweet, tangy, spicy, & salty. Yes, all that and more! I’ll leave some links to my favorite recipes to use this with but honestly there are so many that I’m going to officially say you cant go wrong with this. Spread, slather, dip, drizzle, and sauce away! Add all your ingredients to a food processor or blender and blend until smooth or to your desired consistency. Adjust seasonings to your preference. More lime juice for tang, more maple syrup for sweetness, more sambal oleek for spice. *store in the fridge for up to 2 weeks. **make sure to use Thai Basil as that pairs best with the peanuts. Sweet Basil or Italian Basil will change the taste of this sauce. Feel free to use this with your favorite spring roll recipe, tossed with some rice or soba noodle recipes, as a dip for dumplings or veggies, on the side with the tofu, and pair with any other Thai inspired recipe.